I have been in touch with a Spanish pilgrim who is about to walk the Camino de Madrid. I had convinced him that it was worth the hassle to try to stay in the albergue up on the rocky promontory a bit outside of town. But he informs me that he has spoken with the priest and they have decided to close the albergue to pilgrims. Apparently, this is the topic of a big dispute between the city and the church. I am pretty sure this will not be the last word, because I remember that the albergue was funded with a lot of public money and there have already been a lot of complaints about the way in which the church has given priorities to youths on religious programs. But in the meantime, it like pilgrims can choose between two hotels and one hostal (at least according to mundicamino). This is really a sad development because it is one heck of a spectacular place. That was really bad news. And that means there's now only two albergues before Segovia, one with two beds in Tres Cantos, and one in Cercedilla. If I got it right? And it's a problem especially as the hotels etc in that area are so expensive. The first part of this camino seem to be rather difficult for a pilgrim on a tight budget. Thank you Laurie for keeping us up to date with information. If you are fit you can take 2 days to Cercedilla. 35k from Madrid to Colmenar Viejo (hotel) and Colmenar V to Cercedilla also 35k (albergue). If you do that you only sleep one night indstead of 2 in expensive hotels. If you think that two long days is to much you can take the metro to Plaza Castilla and save some 7 k on your first day. The distance is no problem. But I want to start in Madrid, as it would be fun to first have a boring monotonous day on the pavement and then continue out to the (hopefully) peaceful countryside. And Manzanares seems to be a nice city, and there's a castle there I want to see. I better try to find a low budget hostel or hostal instead. I got a list I printed out, with albergues hotels etc. It's from 14/1 2013. And it says about Manzanares "no hay albergue". It's funny as I was looking at it yesterday, making some notes. And I put a "?" after Manzanares on my list. That albergue gave me bad vibes from the start. I hope things are ok there. I don't know which one is right, but I'll take them both with me. Another thing to consider, if you have a cheap youth hostel where you are staying in Madrid, is to do the first couple of days "out and back" using the RENFE Cercanias (commuter line) trains. There are stops in Colmenar el Viejo and Manzanares el Real and the trains are frequent, especially on weekdays. There are also stops in Tres Cantos and Cercedilla, but they both have albergues. There is supposed to be a cheap pension in Colmenar but I never could find it, though I found a sign for it. Maybe more perseverance would have paid off, but I just gave up and went to the Hotel Chiscon. Expensive but there was a good breakfast included. That's the albergue in Manzanares, isn't it? Am hoping the priest will have to sleep outdoors too. Yes, that news article is from the day they opened the albergue. As I had thought, there were funds from the national and local governments for the project. That suggests that this is going to be a long drawn out fight over who gets to use the albergue. The system is admittedly not ideal now as the priest is the only one with the key and he has a very large territory to cover. As a result, he's frequently not there when pilgrims would like him to be. It would be great to have updates on the situation of the albergue as they become available! Has anybody up-to-date information on whether the albergue at Manzanares el Real is welcoming pilgrims? I was hoping to stay there next month, as it sounds an interesting town, but perhaps I'll have to go on to Cercedilla - that may make more sense anyway, as there seems to be nowhere to stop between Cercedilla and Segovia, unless one detours to Valsain. I believe it is still closed. Manzanares to Cercedilla is only 20 kms, so Colmenar el Viejo to Cercedilla would be do-able at 36 or 37. but the castle in Manzanares is really worth a visit. Finest example of Castilian 15th century military architecture or something like that. I think I read somewhere that Cercedilla's albergue was giving pilgrims some problems (it's owned by the government and is a youth hostel), but I think it's worth a try to stay there, because there are (or were) nice private rooms off to one side reserved for pilgrims. Far from the noisy school groups. Thanks Laurie, as always. 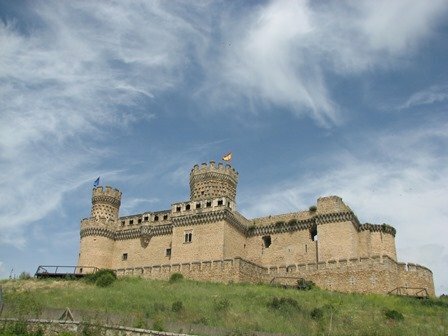 It's the castle in Manzanares el Real that I'm keen to see, and your pics only make me want to more. So I'll see if Colmenar el Viejo-Navacerrada (or Cercedilla if I've time/energy)-el Granja will work for 2 nights/stages, giving a couple of hours in Manzanares, and then a very short morning's walk from el Granja leaving plenty of time to enjoy the wonders of Segovia. Looking forward to it very much, and I'm certainly planning to get my first sello at the church of Santiago in the city centre. Tres Cantos sounds a good spot for the first night, and then see how it goes. I'm not writing it up for the Guardian this time, which will make for more relaxed evenings, and looking forward not having to lug 1kg+ of laptop around, both of which are good. Hoping to leave around 12-5 November, so a little earlier than last year, but I've not been able to book tickets yet. We left Madrid on 12th September. We were told later (by a pilgrim who had stayed there) that there are some pilgrim beds at the Ayuntamiento tel. 918450039 but have not checked this out ourselves. At Manzanares a barkeeper said “Are you staying at the Ermita? Many people do” so maybe it is still open or has been re-opened? In Cercedilla we stayed at the Polydesportivo, in the Sala de Aerobics: there is no other albergue! The receptionist goes home at 10.30 so you must be in by then & let yourself out in the morning! There is no system for receiving donativos so it is effectively free. Basic of course - imagine sleeping in your local leisure centre, showering in the changing rooms - but the exercise mats soften the floor. Albergue turístico en Segovia para peregrinos y otros viajeros. mediados de este mes de julio pasado se ha inaururado en la calle de los Gascos, nº 7 un albergue turístico denominado "Duerme Vela Hostel" con una capacidad de 20 plazas en total, distribuidas en 3 habitaciones dobles, 1 habitación con litera para dos personas, y 3 habitaciones con literas para cuatro personas. Además cuenta con cocina de uso común, salón comedor, salón de cine-TV, ordenadores con wifi, patio y zona para bicicletas. Aseos en cada planta. Precio: 14,00€ (desayuno e IVA incluido) con credencial de peregrino; otros viajeros desde 18,50€ alojamiento. Thanks for the update. Like you, I never found the hostal in Colmenar el Viejo, but people in town assure me it is there. It seems to be in a private home, but finding it may be difficult. It's great that there is now an albergue turistico in Segovia. That must be a relatively new development. Though there are lots of inexpensive pensiones in Segovia, it's nice to have this option. And since it's an albergue turistico, anyone wanting to spend a rest day in Segovia can stay for two nights. My sources in Spain say that the Ermita in Manzanares is still closed. The best way to confirm that would be to go to the priest's house in the center of town, around the corner from the tourist office near the plaza mayor. That's where the keys are. The tourist office ought to know as well. I highly recommend it. Sounds like it would be much more comfortable than the polideportivo! 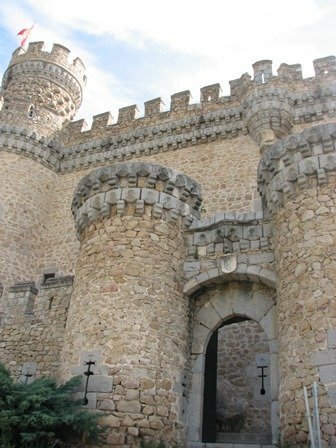 We - my husband and me - walked the Camino de Madrid last September, and I can't give you any information about the albergue in Manzanares, because we didn't look for it & stayed in the Hotel Parque Real, which was not really cheap, but quite nice and in the centre with a very good view on the castle. Before we started I went to an information evening of the camino amigos in Madrid (I was there accidently on a thursday & they have one every thursday evening, in a building very close to Sol), and I bought a spanish guidebook there which was produced by the amigos. Together with the CSJ-guide, we had quite good info about the camino. The spanish guidebook has little maps as well. The amigos also provided an updated list with accommodation (which still has the albergue in Manzanares in it btw). - Tres Cantos - the albergue in the basement of the ayuntamiento. We were there in the weekend & therefore couldn't leave before six in the morning, which was not a problem, because it was dark anyway then. But Tres Cantos: not too atmospheric, unless you fancy this franco style towns. - Segovia - we also stayed in the Duerma Vela hostel: very nice and friendly place in a good spot for 14 euros pp. - Santa Maria la Real de Nieva - albergue was closed. Man on the phone told me he was only closed six days a year, but this day was apparently one, because - ofcourse - town fiesta. We stayed in Hostal Real, which was actually quite good (& a bit strange as well). We got a spotless room for 25 euro and had amazingly cheap dinner there. - Alcazaren - albergue, new & clean. - Simancas - hostal Las Tercias - Simancas is a lovely place to stay, unfortunately without albergue. Hostal is good, and the restaurant Las Tercias is very nice as well. Don't remember the price of the room, but i think it was not expensive. - Castromonte - the huge albergue with 36 beds or so. 6 euro. Good place to stay, but we had kind of a food problem in the village: no shop open en no food in the bars. - and the next day we made a big day to Sahagun. We wanted to stay in Grajal de Campos, because i read something about an albergue there. In the future there will be one, they''re working on it now, so we were told in the bar. I really liked the camino de madrid, although it is not one of the historical routes. It is very quiet, loads of fields, nice pinares, one lovely day in the mountains and not much traffic around. Perhaps that's one of the advantages of being not historical: paths were picked out carefully. I wonder if you have more information on the weekly meetings near Sol. There is also a weekly tertulia near the Plaza Dos de Mayo (place changes depending on season0, but I am sometimes in Madrid on a Thursday and this might be fun. And for anyone interested in the original topic, I just learned that the Pena Sacra albergue remains closed to pilgrims. It is only open for church retreats. This has caused something of a stir because a lot of government money was used to rehabilitate the place. But for now, it remained closed to us. Not sure how often Ria is online so I'll pass on info that I just received from a good friend of mine who is a member of the Amigos in Madrid and volunteers in their office (also look at their website: www.demadridalcamino.org). The office is at C/Carretas, 14, 7º B-3,28012 Madrid (metro Sol). Tel: 91 23 22 11. The Amigos office is open all year round on Tuesdays and Thursdays from 19:00-21:00 for credenciales and on Wednesdays from 11:00-12:30 (except August) and 19:00-21:00 (only in May, June and July). They also meet once a month on Tuesdays for "Martes culturales" for talks on various topics. She said that they are also sometimes open Wednesdays at 19.00 to discuss the Camino or see a movie (per website not in May, June, July or August). Wow. Thanks for all that info, LTfit. It's a shame about the alberue in Manzanares being closed. It was a very nice serene place to stay. Perhaps it may open up again one day? Lee already gave you the practical details of the meeting. The meeting I went to is mainly a meeting for local people who are interested in walking the camino. When I was there it was really busy; most of the people attending were planning to walk the Frances, from Sarria or a bit more on the Frances. We were divided in shifts for a short meeting in kind of a classroom, where the teacher was giving us information on how to walk a camino, with all kind of tips about what to bring and what not & how hard it could get, & what the rules are for getting a compostela & what would be very unpolite things to do to fellow pilgrims . He was however not the most encouraging teacher: he told the one boy that was planning to walk from Porto that it would be really far & lonely and there probably wouldn't be any good albergues on the Portugues. Not the most useful info session i have attended, but surely one of the most entertaining. You can buy a credencial after the meeting. It was nice to meet some of the amigo's: if you're accidentely there it's worthwile to visit them. They are a very lively group & i am grateful for all the good waymarking they did, and for creating the camino de Madrid in the 1st place. It is sure nothing like CF. I am hold up at Hostel Chiscon as I speak. Hostal El Chiscon is nice, so you can rest up there. In Manzanares, I stayed at Hostal El Yelmo. It is a long walk up a hill to get there. If I were to stay there again, I would take a taxi from the center of town, or find a place directly in town. Hope your knee improves. Also, once in Cercidilla, there is no rule that says you can't take the train into Segovia vs walking the 20 miles!! I don't have guilt trips about public transport. I've completed CF I'm a happy pilgrim. Although I am dissapointed , I still intend to get the most out of my trip. Camino de Madrid is so nice Camino although a little bit solitary. But the locals are far more friendlier than those on the CF. I mean they are not just for your money. Maybe they do not know (as you experienced in Madrid) about the Camino going through their towns, but they are sure very helpful. Medina de Rioseca albergue closed indefinitely ...... and then reopened!